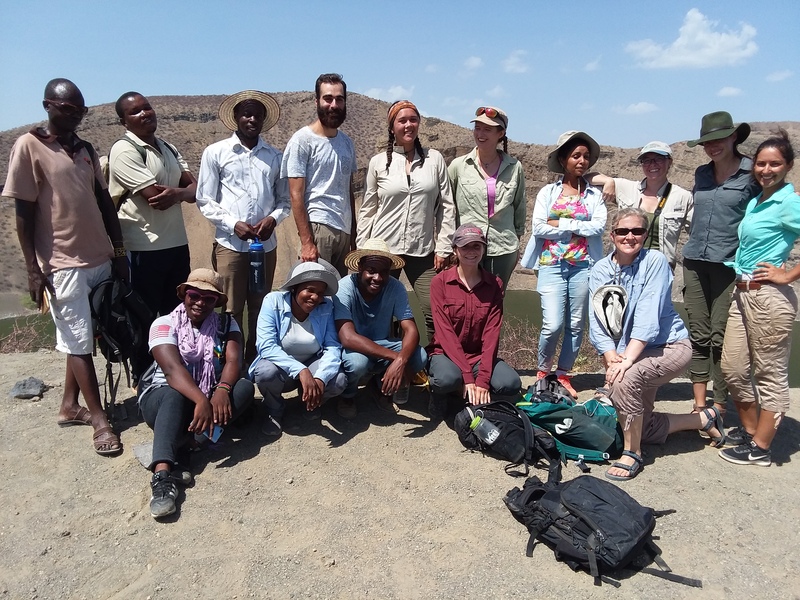 On Tuesday, the field school explored near the edge of Sibiloi National Park to learn more about adaptive strategies of vegetation in such an arid environment. 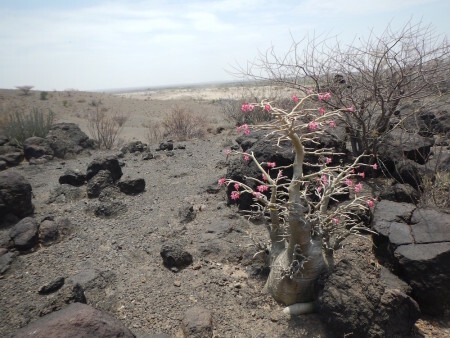 In particular, we focused on the desert rose, Adenium obesum, a rather amazing tree. 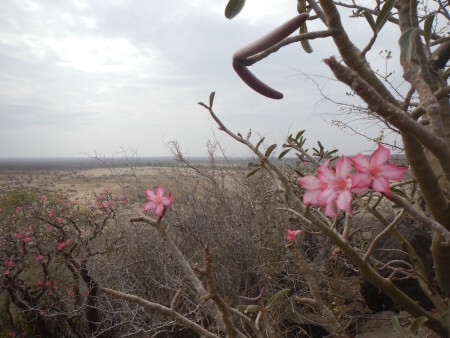 The desert rose is an incredibly slow growing tree, growing an average of 1 millimeter per year. 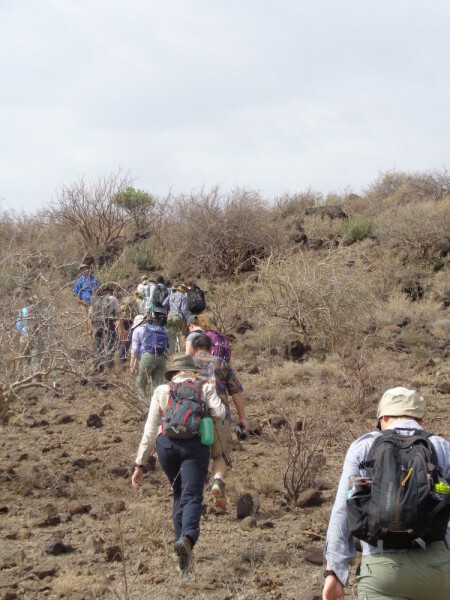 It has a very thick trunk for water storage, a waxy coating to help retain water in such an arid environment, and produces rather few leaves and flowers per year to conserve energy. But when it does produce flowers, they are a brilliant pink, and radiate against the harsh landscape. Even a smaller desert rose such as this is probably several hundred years old. These gorgeous flowers are easily spotted against the rugged landscape. 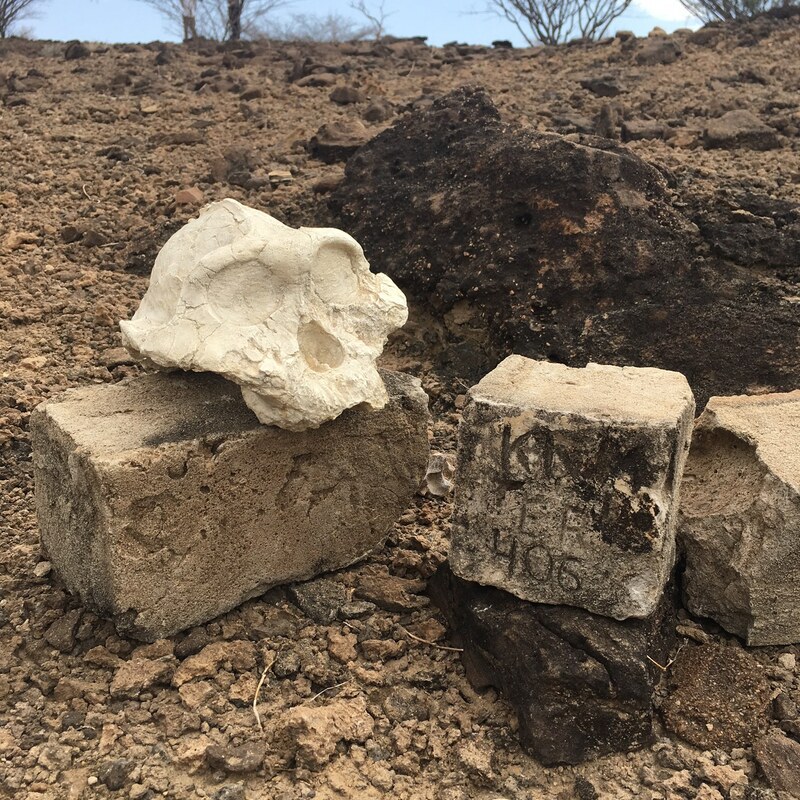 The desert roses we were looking for were scattered around a rocky outcropping. So up we went! To find the age of a desert rose, you must find the diameter of a plant in millimeters, which roughly translates to the age in years. However, in field work, it is more accurate to measure the circumference of the plant, and to calculate the diameter afterwards. 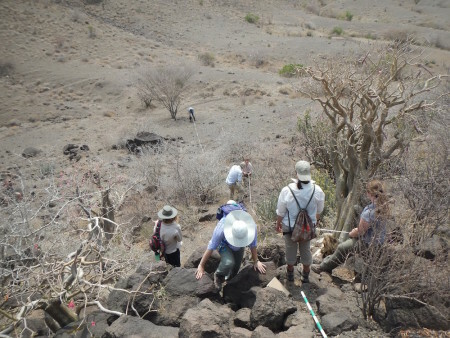 Dr. Martins assists Jon and Tobias in measuring the circumference of this desert rose as Barabara approvingly looks on. The students tackle this multi-trunked tree on their own! We also measured the height, using Jacob’s staffs. While the height is less indicative of age, it is still interesting to note how these ancient trees grow. 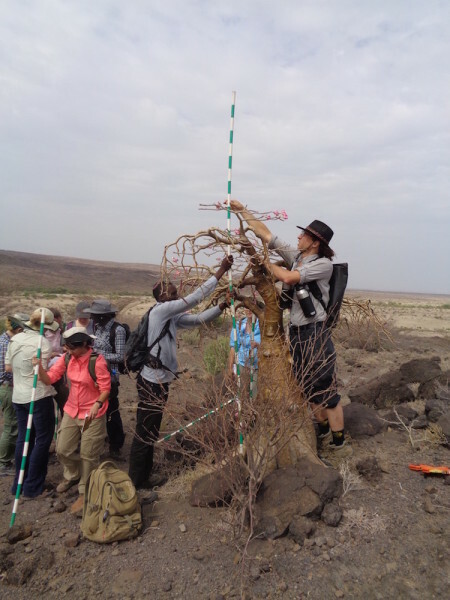 Jon and Tobias work together to measure this desert rose to its highest point. 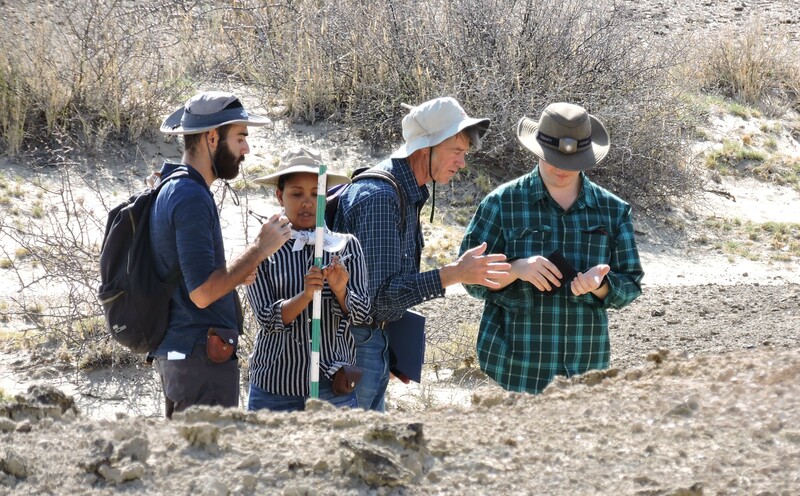 Millie instructs from a distance as Tobias and Yvette try to straighten the two Jacobs’ staffs to obtain an accurate height. After taking a few measurements to practice, we started our field practical. 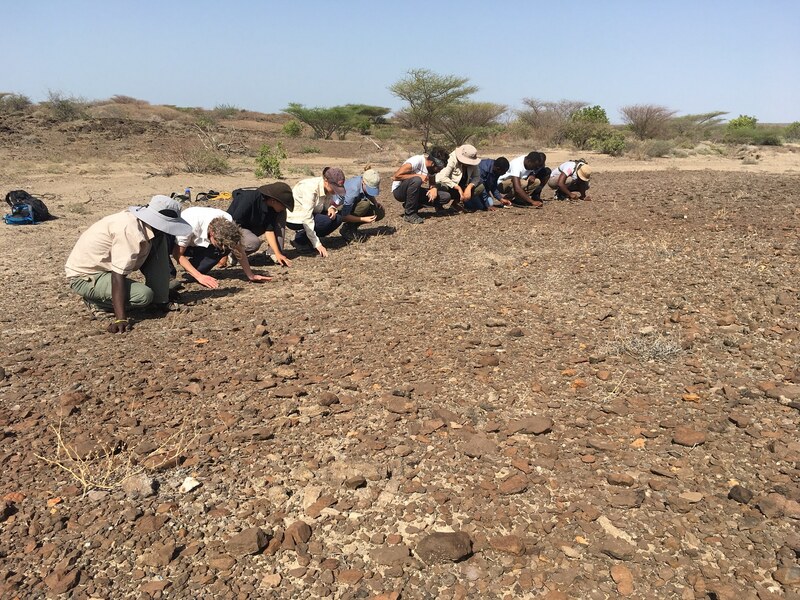 The students were divided into two groups, and each group measured out a forty meter transect, with the primary goal to measure every desert rose that fell into this transect area. 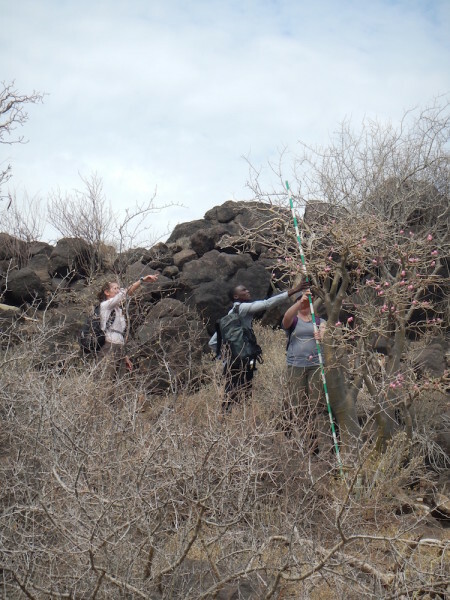 Noting the surrounding plants that fell into the range of the transect is also important to accurately paint a picture of the landscape in which these desert roses are living. 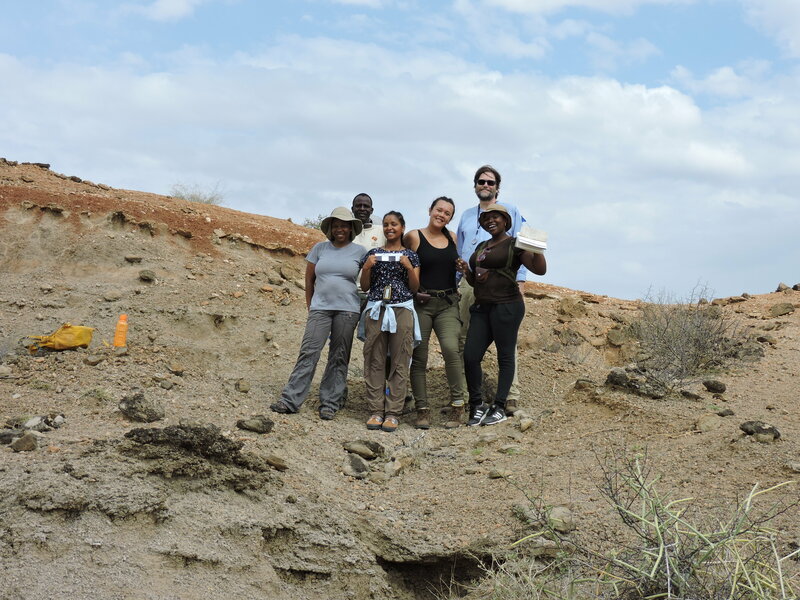 Jayde, the hard-working TA, ensures that the students lay the transect correctly. 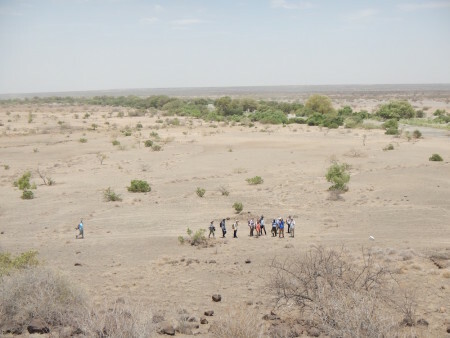 These students were really challenged by strong gusts of wind and had to really work together to keep the transect line straight! 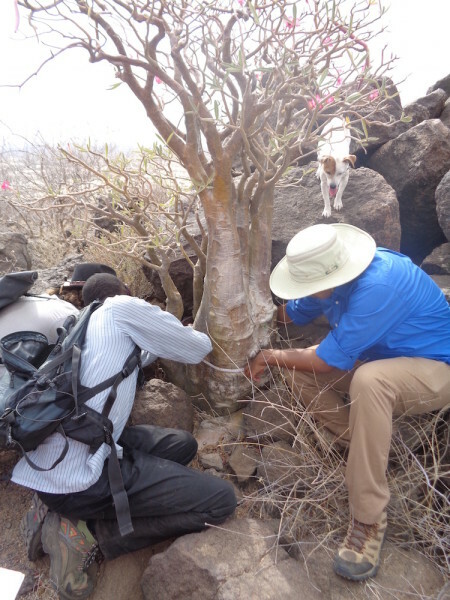 Because desert roses tend to be found in relatively close proximity to other desert roses, it can be inferred that the oldest tree in an area is the “grandmother” of most, if not all of the others. 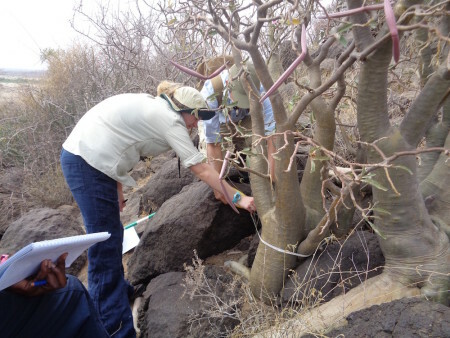 One of our goals in this practical was to calculate the age of all the desert roses we measured, and determine which tree was the grandmother. Below is the data, including calculations, from the practical! 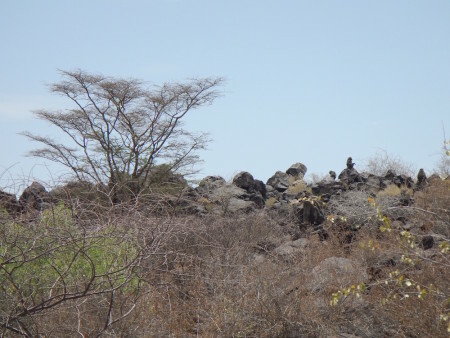 On our hike returning to the lorry, we saw some baboons on a nearby outcrop that had traveled out from inside Sibiloi National Park. We were very lucky as it is rather rare to see baboons here! 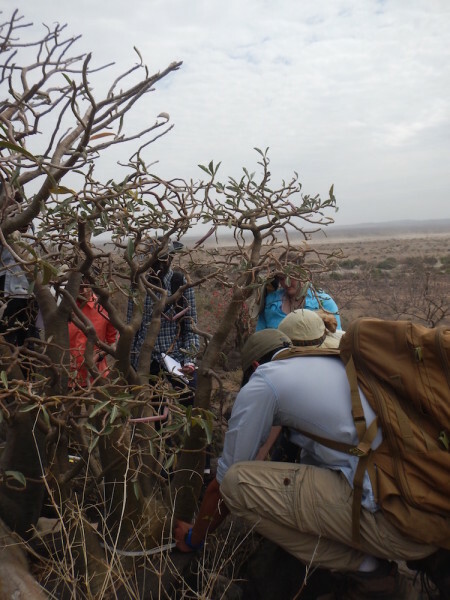 The students crowd around as Dr. Martins discusses the baboons on the nearby outcrop. 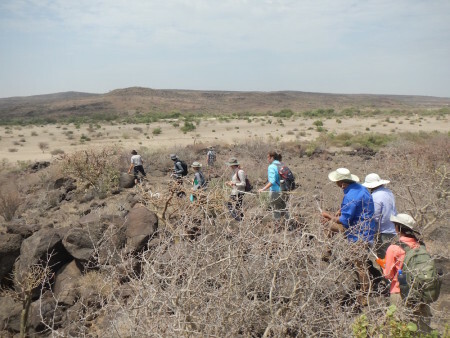 Later in the evening, we took a brief walk from camp to some nearby exposures to get an early peak at the geology module as well as to discuss the ancient ecology of this area. On our way back to camp, we were treated to a truly radiant sunset. 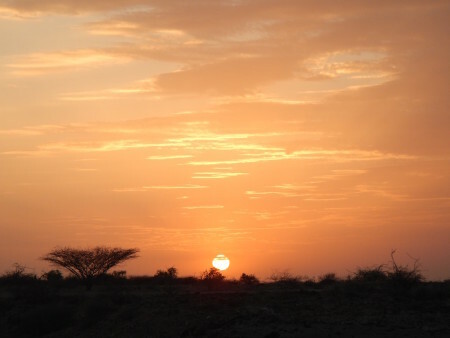 An acacia reficiens (foreground) basks in the evening glow as the sun sinks into the hills. 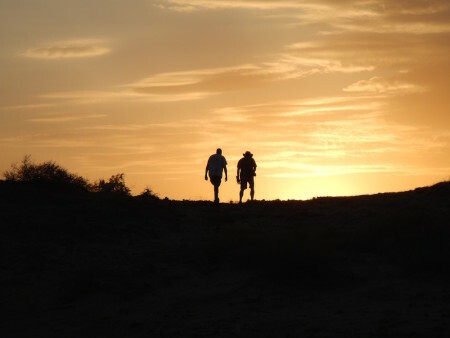 Dr. Dino Martins and Dr. Lawrence Martin hike into the sunset.